The forum was aimed at concretizing Kenya’s position ahead of the 9th World Urban Forum (WUF9) scheduled for 7th – 13th February 2018 in Kuala Lumpur, Malaysia. The theme for the WUF9 is “Cities 2030, Cities for All, Implementing the New Urban Agenda.” and it will be the first global session focusing on implementation of the New Urban Agenda (NUA) since its adoption in 2016. 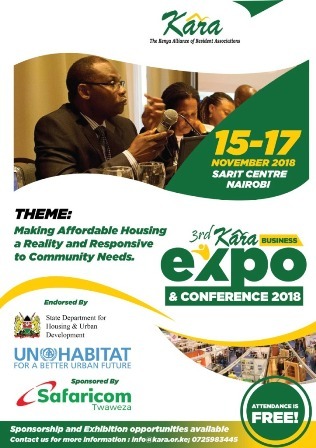 Speaking at the forum, Cabinet Secretary for Transport, Infrastructure, Housing and Urban Development Mr. James Macharia urged the urban sector stakeholders to work together and focus on implementing the NUA in Kenya. He called on them to support the government in achieving sustainable urbanization playing specific roles as identified in the country’s’ popular version of the New Urban Agenda. Chairperson of the Council of Governors’ Committee on Housing, Lands and Urban Development Hon. Ferdinand Waititu encouraged the County governments to promote sustainable housing initiatives and development control guidelines to realize sustainable urbanization. He pointed out that counties were the next frontiers for investment and economic growth. Kara through its Chief Executive Officer chaired a session on Kenya’s Country Report on Urban Agenda. The report will inform and guide Kenya’s participation in the WUF9 in Malaysia. He stated that Kenya should take advantage of the renewed global attention on sustainable urban development and roll out initiatives that will lead to sustainable cities and towns hence better services for Kenyans. NUA is a framework that lays out how cities should be planned and managed to best promote sustainable urbanization. It will guide the efforts around urbanization of a wide range of actors for the next 20 years. Kenya through the Housing Department in the Ministry of Transport, Infrastructure, Housing and Urban Development has prepared a popular version of the NUA to contextualize and unpack the global agenda to reflect Kenya’s realities and priorities. The thematic areas of focus for Kenya are: Housing and basic services; urban and human settlement infrastructure; land, urban and regional planning; urban economy; environmentally sustainable and resilient urban and human settlements; urban governance.